Upon entering my chosen culinary school for the first time on August 17, 2001, I was escorted to the central office. After signing my student loan documents (sigh…) and the school’s safety waivers, I was shown to the bookstore. Including the toolkit, uniforms and 1st semester books assigned to me, the total bill was just over $1800. Happy as a 17-year-old clam, I hefted the whole bundle back to the apartment I shared with 3 strangers. Fortunately, all of those items were used and used well for years to come. I made those 3 uniforms last the entire Associate’s degree and some of those tools made it to my current toolbox (which is a contractor’s one I bought for $30 at Lowe’s). The most valuable thing in the lot, though, was the culinary textbook used in every class throughout college. I gifted that used, scribbled-in and dogged-eared tome to an intern I had in Georgia back in 2004, so she could take it home to Kenya and study it as I had. By that point, I had memorized every line inside, anyway. That book was so valuable because it outlined all the terminology and phrases I’d ever need in any kitchen, personal or professional. 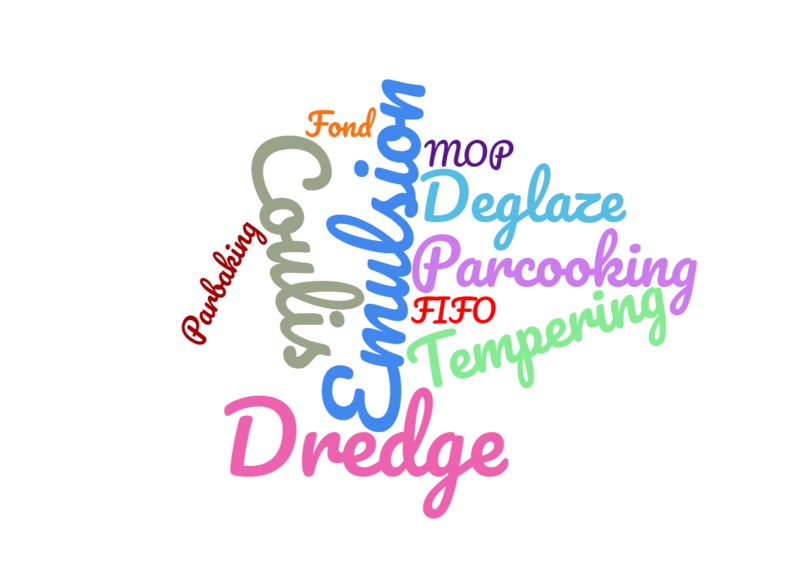 A lot of those terms are ones you might hear thrown around, while others are rarely used outside commercial kitchens. In any case, I may slip up and toss one out from time to time, so I thought I’d start with a comprehensive list to start this series. Anything in quotes means it’s a translation from French, the mother language of culinary arts. You’ll see that not every term is included – I apologize. There are a lot of terms and phrases, as there can be in any specialized profession. Words to describe knife cuts will be covered in the next article (spoiler alert!). If there are ones you’ve heard but don’t see, feel free to leave them in a comment and I’ll answer. I’m here to help navigate the everyday cook through the storm, so just ask. You got this!